Image courtesy of Jelly Belly. My family and I have become obsessed with Jelly Belly, They are always bringing out new flavours and we just can't stop munching them.This week Jelly Belly sent me a 5 flavour box of their Jelly Belly sours. The box has sour cherry,sour lemon, sour peach , sour apple ans sour grape. These mouth puckering eye popping refreshingly Sour flavours will wake up your jaded taste buds or nothing will! Having sampled each flavour, my all time favourite was definitely the sour lemon.You get a sweetness in your moth and then a sour burst as you chew them.These are not for the faint hearted they are seriously sour but so very delectable. 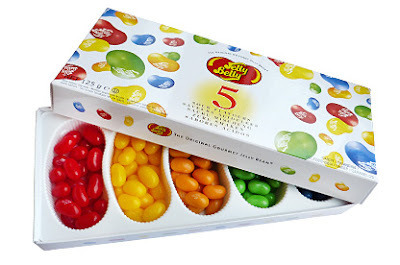 Since I got to sample there lovely Jelly Belly Sours, I thought it would be nice for simply.food readers to be able to do the same.Jelly Belly have kindly agreed to provide 4 prizes of a box of 5 flavour Jelly Belly Sours for simply.food readers. Thankyou to Jelly Belly for sending me a sample box and for providing the prizes. All views and opinions in this post are my own. How about sour lime? I generally prefer lime over lemon in my cooking as it is more aromatic. Just love the faces people make when eating sours. How about rhubarb - that would be fab! I would love a sour blueberry, that would be nice ! I like it when blackcurrants are really sour! Like a sour summer pudding flavour! Sour citrus! A mix of lemon, lime and orange? Sour Blackcurrant - no one ever seems to make this flavour! how about building on the lime theme and making a Margarita flavour one, mmmm! Sour clementine would be nice. But how about a lemon juice one, real lemons with no sweetner, that would be tangy! I'd love to see more cocktail flavours - how about a Cosmopolitan? Dandelion and burdock would be nice. I would mix my two favorite types of food- sour & coconut! These look tasty. I will have to fight my BF off them lol. I really love the combination of rhubarb and ginger! !